Size is one of the most common themes in the tech industry. Usually, the smaller a device can be made without sacrificing too much performance, the better. This is especially true with regards to memory, as the physical size of memory can make or break the user experience. The memory business is also subject to rapid change, as physical size, speed, and capacity are never at a stand still. 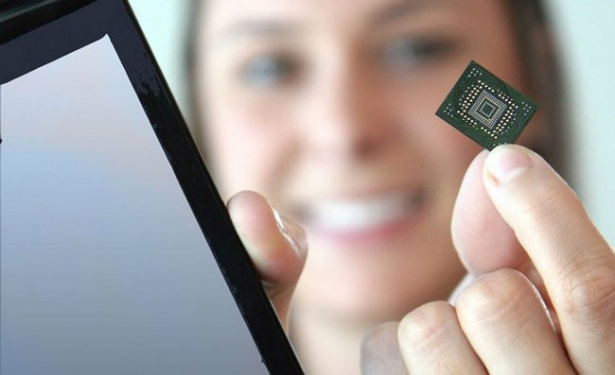 Following that trend, flash memory manufacturer SanDisk has released the fastest embedded Solid-State Drive (SSD) in its size. Just how small is the SSD? With dimensions of 16 x 20 x 1.85 mm and weighing in at less than a gram, it is roughly the size of a postage stamp. Using conventional Serial ATA (SATA), the SSD is actually an Integrated SSD (ISSD) that can be embedded into other devices. Therefore, it’s not an external drive or a flash memory card, but is an actual integrated circuit (IC) that can be soldered directly onto a motherboard. It should be noted that you won’t actually be able to go out and buy one of these, however, this same technology might soon be introduced into many different types of devices. Some of those devices include smartphones, tablet computers, netbooks, and even routers. In terms of capacity, the drive ranges from 4GB all the way to 64GB. Taking a step away from conventional drives, the embedded drive approach seems more promising, especially in mobile applications. The tradeoff between capacity and size is really unbeatable. Normally, 64GB SSD drives come in lengths between 50-76 mm long. In comparison, the ISSD has a length of only 16mm, making it almost 4 times smaller. Of course, when comparing disk drive sizes, there’s absolutely no contest. A 64GB hard-disk would dwarf an ISSD. Not to mention, there is a significant weight reduction as well compared to other drives making ISSD a perfect replacement. Apart from size, SSD drives are also known for their speed. An advantage of using a SSD as opposed to a regular disk drive is the startup time. In addition to better overall performance, a device using a SSD will boot much faster than one that uses a disk drive. SanDisk’s new drive boasts 160MB/second and 100MB/second sequential read/write speeds respectively, both of which are very close to full size SSD speeds. It’s nice to see that the drive hasn’t taken too much of a performance hit being so small, however, the numbers SanDisk has claimed are always subject to change. As of now, SanDisk has released the ISSD’s for original equipment manufacturers (OEMs) to evaluate. That means that manufacturers are currently testing out the SSDs in order to see how well they work in potential devices. No OEMs have picked up the device so far, however, that may change soon. Hopefully, before we see the SSDs in other devices, it would be nice if they were offered as external drives manufactured by SanDisk itself. If not, we’ll just have to wait until they start making their way into many mobile devices.